This fall, I had the pleasure of being interviewed by Anthony Fleet, advisory board member of The Brothers' Network in Philadelphia. 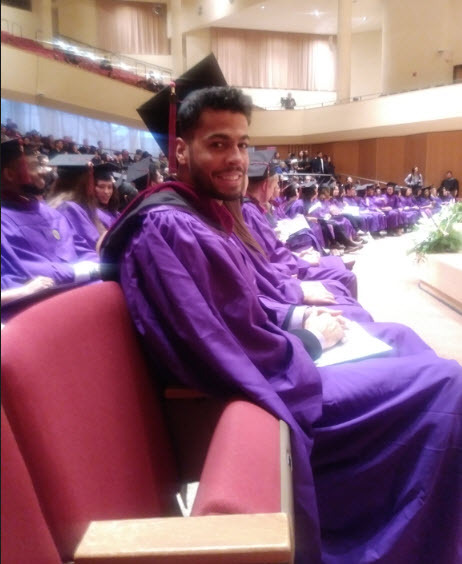 Anthony recently completed his Master's Degree in Integrated Marketing Communications at Northwestern University through a semester abroad at Sciences Po in Paris. He graciously granted me an interview about how travel and study abroad have changed his life. In Part 1, Anthony talks about how he came to decide that he wanted to travel abroad. DP: When and how did you first realize that traveling abroad might be something to aspire to? AF: In 2015, I attended my first event hosted by The Brothers’ Network (for which I am now an advisory board member). There were a lot of well-dressed, well-spoken professional black men present. At the beginning of the event, there was an icebreaker, and each person present was asked to share his or her favorite country he or she had visited. I looked around the room watching people share their abroad experiences. At the time, I had never left the country. After hearing people talk about places from all over the globe, I was excited to one day have those experiences. DP: How did this idea make you feel? AF: I was excited, but I also felt unsure of how it would actually happen. And at that time, I had never been on an airplane, so I was apprehensive about the idea of flying. DP: Where did you think of going on your first trip abroad? AF: At the aforementioned event hosted by The Brothers’ Network, I imagined myself going to all of the different countries the men and women were mentioning. I think what appealed to me most was Japan. DP: Why did you want to go there? AF: To me, Japan is another universe. There’s a lot of mystique that surrounds Japan in my mind. It’s so far away. But I also hear about Tokyo and how technologically advanced they are. And as a transportation and train enthusiast, Japan is home of the Bullet Train, which I hope to ride someday. DP: Where did you end up going on your first trip abroad? AF: Excluding two road trips to Montreal and Toronto, my first trip abroad was to Paris. DP: How did you feel when you obtained your first passport? AF: My godfather (Gregory Walker) told me to get it. At that point, I had never left the country or been on an airplane. I did not have much intention to leave either. I still had a year and a half left as an undergraduate at La Salle University in Philadelphia. I also remember it cost about $200, and to me it was buying a really expensive ID card. DP: Traveling abroad does not necessarily mean that you will study abroad. When did you first consider studying abroad? AF: While I was a graduate student at Northwestern University’s Medill School, where I majored in Integrated Marketing Communications. Our program provides students with an opportunity to go abroad. The Paris program was most in line with my interests, so I applied and was fortunate enough to have been selected. DP: Where else did you consider going as a study abroad destination (were there places other than Paris)? AF: Medill’s Paris program was set up for students to come out for a whole semester, so Paris was primary. London and Asia were secondary because the London program was only a month long and the Asia program was only two weeks long. I wanted a full, immersive abroad experience for myself. In addition, the Paris program was more communication-centric, which peaked my interest. DP: How did this trip turn out? AF: Great - better than I could have imagined! I came to Paris for school, so at the very least I was going to live there for an extended period of time. I also had a place to go to and meet people. Speaking of the people, my classmates at Sciences Po were incredible. They were all at least trilingual. Pretty unbelievable to see them flip one language to another like it’s nothing. Also, the opportunity to meet African-American expatriates was fantastic! I did not expect there to be as many as there were. Finally, the ability to travel from country to country so quickly is what makes Europe so great. DP: How did you prepare for your move to France? AF: The main thing was finding a place to live. I had a couple of friends who had lived in Paris at different points in their lives, so I consulted with them about where to live and if it was really worth the cost. I received good feedback and assistance on that subject, and ultimately settled on a place. Otherwise, I didn't do a whole lot of preparation. I honestly did not know what to expect. Come back to the Entrée to Black Paris blog next week for Part 2 of my interview with Anthony Fleet.